There are hundreds of industries that can benefit from custom keyboards and keycaps, and we have many happy clients, but the following case studes and testimonials represent a glimpse into what custom keyboards, keyfronts, keycaps, computer keys, and keyboard overlays can do for your company. 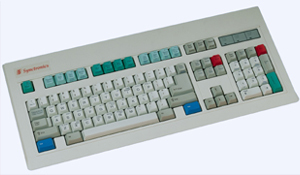 A customer using Coyote software needed to change from an older KB 3270 keyboard to something that supported newer Microsoft operating systems. We solved their problem with a keyboard that has an identical 122 key layout. "We had to change from an old custom mainframe keyboard to a PC keyboard. The ability to have custom keys that matched the old style keyboard eliminated the need to retrain long time employees, plus we didn't lose any productivity. Also custom keys make training new employees very quick and easy." A customer contacted us in need of a keyboard to reduce training time. We suggested using colored keys with appropriated legends. This is like adding the training manual to the keyboard. "Don't schedule a training session until you have the custom keys installed." In telemarketing every second counts. Our customer asked how a keyboard could make their operators more productive? By using colored keycaps and not using menus, which reduces the average time of each call. "Without the custom keys we would be unable to quickly identify our specialized Function Row Keys... plus we have color coded frequently used keys speeding up entry of critical information." Color-coded keys help prevent errors for 911 operators. Custom keyboards make finding the right key easy when time is critical. "Our System depends on accurate and efficient data entry at all of our workstations. Standard keyboards could never get the job done and making labels was too time consuming and wasn't effective because they don't last. Custom keys on standard keyboards cut down on training time, sped up data entry, plus they look more professional." 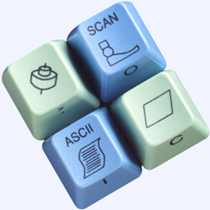 Our customer needed their function keys labeled to enhance existing telemarketing software. After they found the cost benefit of custom function keys, they realized additional increases of productivity could be gained with more customization. Ultimately they customized almost every key on their keyboard. "With over 120 workstations in our telemarketing department, our custom keyboards paid for themselves the first week." —Marketing manager for a Fortune 500 company.